There are many different curtain fabrics and styles to choose from when you are shopping for curtains, but some are better than others. Linen curtains in particular are an ideal choice for curtains for almost any room. From Ada & Ina you can buy curtains online - ready made or custom made. A particularly crisp appearance to your curtains may be best served with artificial fibres. But for almost every other need, natural linen or cotton is a better choice. Linen curtains are available in a vast array of colours and prints, and give a soft and gentle finish to your rooms. These curtain fabrics have many benefits when compared to artificial fibres. Linen might crease slightly but after the curtains has been put up they will look gorgeous and you will soon forget the ironing project which was not that difficult after all. Many man-made fibres on the other hand are very sensitive to heat, as ironing them with too hot iron may actually cause them to melt. Linen is more resistant to heat and can comfortably be ironed, restoring your curtains to their most tidy appearance. The softer and sheer linen is particularly suited to windows that are frequently opened, as they can blow gently in the breeze. Man-made fibres tend to be more stiff and unforgiving. The softness of linen makes them look more casual too - everyone will notice your lovely linen curtains. Linen has the ability to insulate far better than man-made fabrics can do. This means that your linen curtains can help to keep a house cool in the summer by keeping out the bright sunlight, or can insulate windows from the cold in the winter. This makes them an ideal choice, whereas man-made curtains are not so well suited for heat insulation. Linen can be produced in a natural, highly unrefined state. In this form is it soft, and once washed well enough that the natural oils are removed it is absorbent and easy to care for. Natural linen does not require bleaching, instead it has a warm natural colour. That is why there is no need for the use of chemicals that can potentially cause pollution to the environment - in particular to our waterways. Natural linen curtains are simple, yet gorgeous. From a safety point of view, linen is always a good choice for curtains. Whilst both linen and man-made fibres will burn, man-made fibres tend to melt and drip, and will stick to objects that they come into contact with, if they catch fire. This poses a greater hazard in a house fire, and the melted, hot curtain can stick to skin. Linen, especially natural linen that has not been chemically treated, is less flammable. 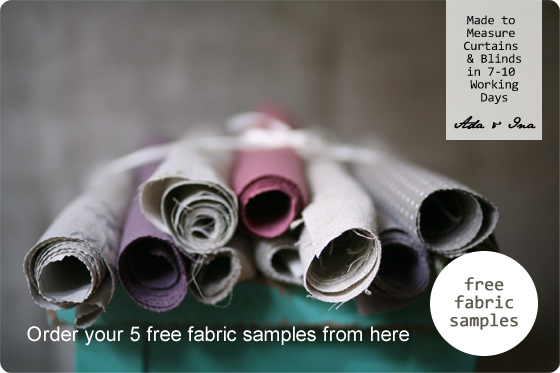 Ada & Ina will make beautiful hand finished linen curtains for you at very reasonable prices!